How to convert personal account to Pinterest business account? Pinterest is an online pinboard, a visual interpretation of the social bookmarking webpage. Unlike other online bookmarking services like Digg and StumbleUpon, the content you shared on Pinterest is totally driven by visuals. In simple language, you can’t share something on Pinterest except if it doesn’t have a picture. 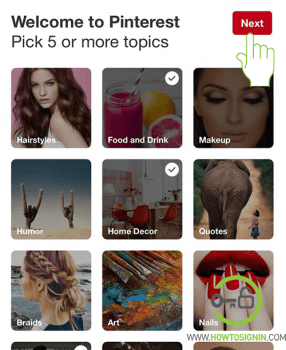 Like other popular social media site, in Pinterest, users can perform mainstream social media behavior like following other users, liking, commenting on others pins, sharing others pinned content to their own profile known as boards. You can share pictures you discover on the web, or you can specifically transfer photos onto Pinterest. Utilizing the Pin It button, you can share the images directly in your browser from any website page. You can likewise share your pins on Facebook and Twitter. Sign in to Pinterest if you already have an account. When you share something on Pinterest, every bookmark is known as a pin. It’s known as a re-pin when you share another person’s pin on Pinterest. You can stick pin together by subject onto different boards or pin-boards in your profile. Each board mirrors a real pin board. Just like other popular social network platforms, Pinterest is free to use. You must have a Pinterest account to start using it. 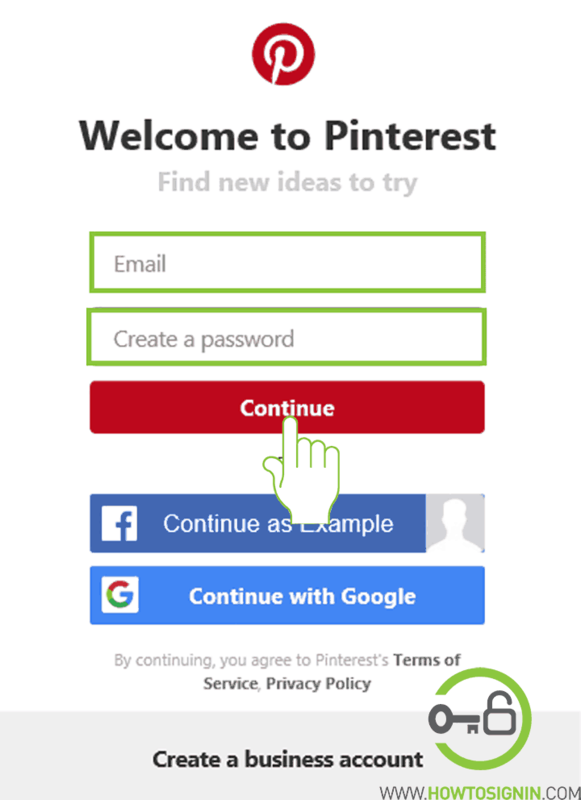 To create a new Pinterest account, you just need to have your email and password. You won’t even need that if you choose to create a new Pinterest account using your existing Facebook or Google account. 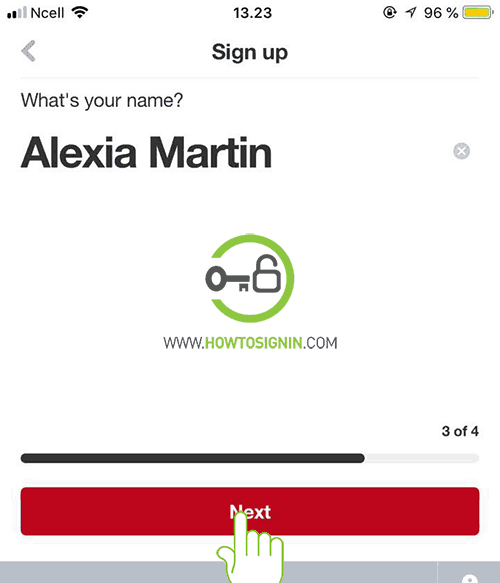 After you put up your email address and password, further you would be asked to enter other few information about yourself such as your name, gender, age, language, and country. In the end, you will need to choose at least five categories of your interest so that Pinterest can show pins respective to your interest. Visit Pinterest.com from the web browser available on your device. 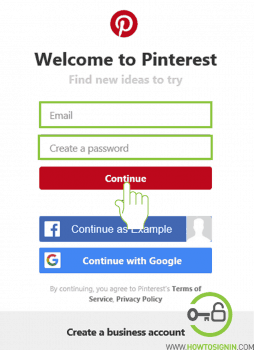 You will see Pinterest sign up box directly on its homepage. 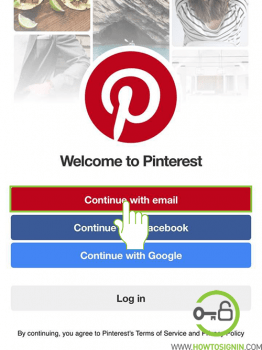 You can sign up for Pinterest using an email address, Facebook account or Google account. If you want to create a new Pinterest account using your email, then enter your email id and password for your new Pinterest account. 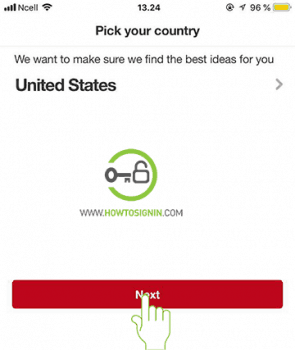 You can also create a new Pinterest account using your existing Facebook or Google account. 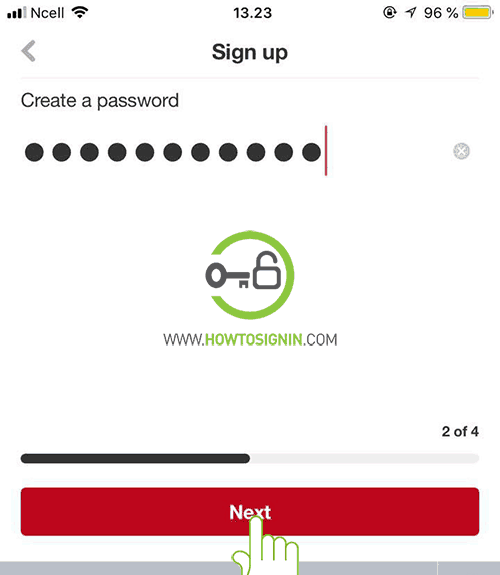 Just click on respective sign up button. In the next step, you would be asked to describe yourself providing information about yourself. In this step just select your gender. Now choose your preferred language and your Country. Your boards and Pins are personalized based on the information you provide. The language you select here would be used on your Pinterest account. 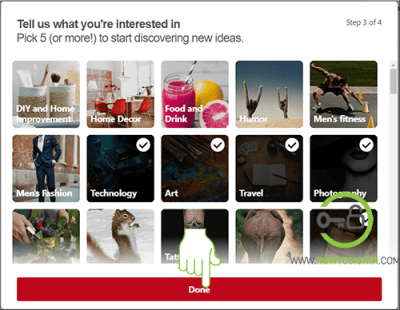 Finally, pick at least five fields of interest so that Pinterest can personalize boards and pins recommendation that is shown to you after you successfully sign up to a new Pinterest account. Lastly hit Done to start using the Pinterest account. Download the Pinterest app for your phone. Go to Pinterest app and tap on how you wish to create a new account. You can continue with email, Facebook or Google. Select Email option to sign up. 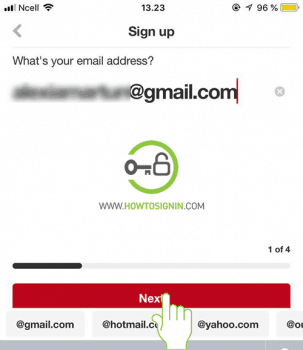 Type your email address and tap next. The app will ask your age, answer it. Select your gender; it will help Pinterest to find you more relevant content. Choose your country. Contents of the site depend on your location. Choose five interest from the board. Your Pinterest registration process is complete. Select five or more topics to continue. You can make a new Pinterest account with Google or Facebook. 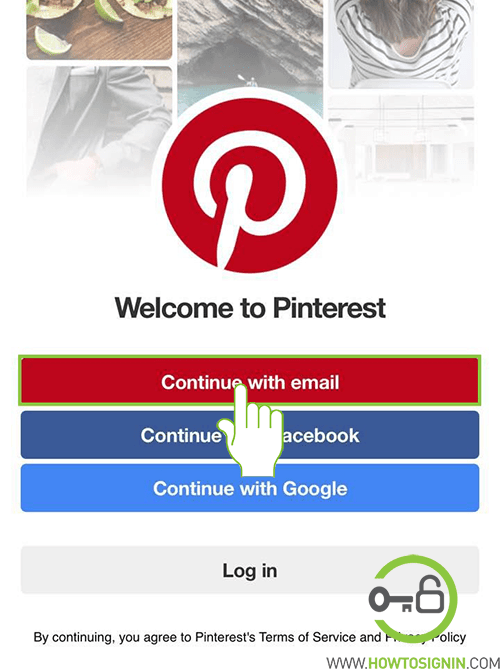 Open the Pinterest app and select the option Continue with Facebook or Continue with Google. Login to respective account and follow the on-screen instruction. Pinterest provides a specially designed account for companies and organizations for free with few more advantages like the use of widgets and buttons, known as Pinterest for Business. Set up a new Pinterest account for business without spending a single penny and in quick time easily. You need your company email, company name, and password for creating a new account. Go to the Pinterest homepage. Click on Create a business account just below the sign up page. Enter the email account you want to register. 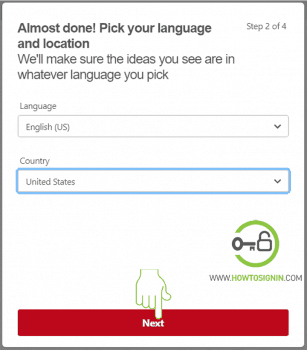 Create a new password for your new Pinterest business account. Provide the name of your business. Select your business from the drop-down menu. Now your brand new business account is ready to roll. Sign in to a Pinterest account which you want to convert. Pinterest has recently started providing tutorial materials for the users of business account on their business site. It helps users to learn how they can use Pinterest for business service to drive traffic creating compelling pins and pinboards. You can also build a community for collaboration and grow your business. The Pinterest business account provides more features like Widgets and buttons. Also, Pinterest is coming up with more exciting tools and services targeting Pinterest account for business.